We here at EcoWise Planters have had excellent garlic growing results using various locally grown species acquired from our local Organic greengrocer, we do a taste test of the smaller internal cloves first and plant out the most delicious and largest cloves, the reason being that new bulbs are clones of the old, so if the garlic tastes average it will not improve with successive growing. Garlic is best started from local Australian certified organic cloves as they are free from pesticides, have not been bleached or raised using toxic chemicals, have not been fertilised with human waste (China) and do not harbour hazardous bacteria. Australian organic garlic is vital as most commercial garlic is irradiated to extend shelf life and inhibit sprouting. Farmer’s markets, organic greengrocers, online retailers or certified growers are the best place to source garlic for growing, look for large and healthy cloves, each clove will grow one bulb. Prepare your planting area a few weeks prior to sowing, enrich the soil with compost and well rotted chicken manure by roughly digging a spadeful into each spot where you intend to plant, water in well. Gently separate your bulb into individual cloves, select the largest cloves and sow directly in your EcoWise planter. To sow make holes in the soil that are approximately twice the depth of the clove, push the clove into the hole pointy side up and gently back fill with the soil, space cloves 12cm apart. Once sown, water the cloves in well from above your EcoWise Planter and mulch over the area. Keep garlic moist while growing and fertilise with a liquid feed every 2 weeks. Seasol, compost tea or diluted worm juice are all excellent options. Stop fertilizing one month before harvesting. Beets, Carrots, Cucumbers, Dill, Tomatoes and Parsnips. Asparagus, Beans, Brassicas, Peas, Potatoes. About 7-8 months after sowing your garlic will be ready to harvest, indicators of readiness are the browning of lower leaves, if the variety flowers you will see a softened yet green flower stem. The best test is to gently pull back the soil around one of your plants, if the garlic bulb has a defined, ridged shape and look large then you can go ahead and pull up all of your plants by hand. To do this simply grasp the foliage near the soil line and pull upwards. Never use a garden fork as it may damage your bulbs. To avoid split bulbs don’t wait until the foliage has completely died back and browned, split bulbs are still excellent for eating but will need to be used immediately as they will not store long. Be sure to leave any dirt on your bulbs alone, this can be gently brushed off once the bulbs are cured, although I suggest leaving it be as it is not worth risking damaging bulbs. Prepare your garlic bulbs by removing all but about 1cm of the roots with sharp knife scissors; be sure to keep the leaves attached and the bulbs whole. 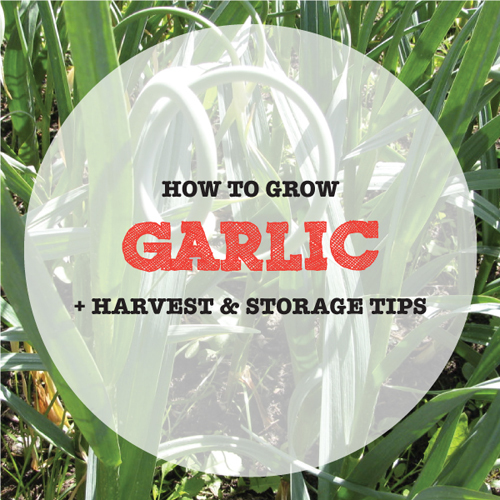 Garlic will take between 3-8 weeks to cure; this is essential for long-term storage. Cure your garlic under cover in a dry, airy position that is not too hot. Hang the garlic in bunches or place on drying racks. Once cured Garlic forms a protective, papery skin that is necessary for storage. Check your garlic regularly during the curing process for mouldy leaves, if you spot any be sure to trim the leaves off to avoid it infecting the bulbs and continue curing the bulb on a rack. Recycled fly wire window screens are excellent for curing garlic on, just be sure to have good airflow circulating around the bulbs. If you planted softneck garlic varieties the leaves may now be braided, otherwise cut the leaves off 2cm above the bulb and store the bulbs somewhere with free flowing air circulation that is not too hot or moist. Recycled orange nets are perfect when hung. Keep an eye out for any degrading bulbs as the weeks go by and eat them first. Hanging garlic can be store anywhere from 6-12 months. A short-term storage solution that will keep garlic fresh for up to 3 months is freezing, to do this separate the cloves into a zip lock bag, be sure to remove as much air as possible.